Maria Carey isn’t your average Hollywood singers — she’s is one of the most eagerly talked-about mom of twins; the one who realistically left her loving husband, Nick Cannon, without a divorce to get married to billionaire James Packer. But it looks like Karma visited her while with James Packer that automatically turned their anticipated marriage into a breakup. 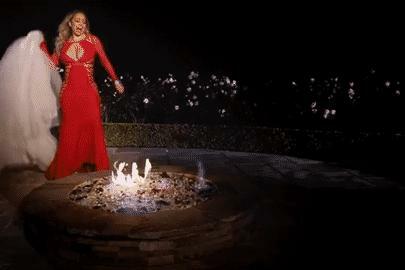 Mariah and James stylishly and maturely parted ways but her wedding dress couldn’t stop reminding her of the relationship and the best way to reset her memory was setting the high-end Valentino dress ablaze.